Betfred Poker Review - Casino Answers! Betfred is a large sportsbook based in the UK, and they also run their poker room, based on the IPoker Network. They have a big signup bonus, and operate the Betfred Poker Premier League, where the top players each week win a poker chip set, and the top thirty finishers get entry to a $2,000 freeroll. Promotions: 100% to $500 sign-up bonus. Betfred Million! Betfred Poker Premier League. $5000 Stephen Hendry Freeroll. Beat The Boss Freeroll. Qualify for the EPT grand Final Monte Carlo. WPT & WSOP Satellites. SNG Jackpots – Fort Knox, $100,000. Rio, $25,000. Dirty Dozen, $25,000. Maui, $15,000. Betfred Poker Freerolls: $5,000 monthly freeroll featuring snooker pro Stephen Hendry. Betfred Poker Deposit/Withdrawal Options: Maestro (Switch), Solo, Visa Delta or Laser, Mastercard, Visa, Cheque, Bankers Draft, Bank Wire, Bank Transfers System(BTS), Neteller, PrePaidATM, Citadel, Western Union, Fedex. 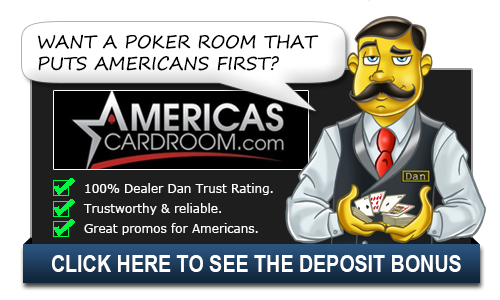 Dealer Dan’s Bonus Rating: It’s refreshing to see a Sportsbook focus so much on the poker side of things, and with some excellent promotions with a lot of attention to detail, as well as my experiences with every aspect of Betfred being so great, they earn an extra star. Betfred has a sportsbook, casino, bingo hall and of course a poker room, making it an all-in-one stop for all of your online gambling needs. Betfred Poker has fishy Backbet tables and high traffic Texas Hold’em tables, but what we love most about Betfred is its soft Stud games. As you can tell, there’s plenty of variety at Betfred Poker and something for just about every kind of poker player.